With the equity market continuing to rally from the pre-FOMC low of sp'1972 (with a new historic high of 2092)... the VIX is naturally very subdued, settling 0.9% @ 14.50. 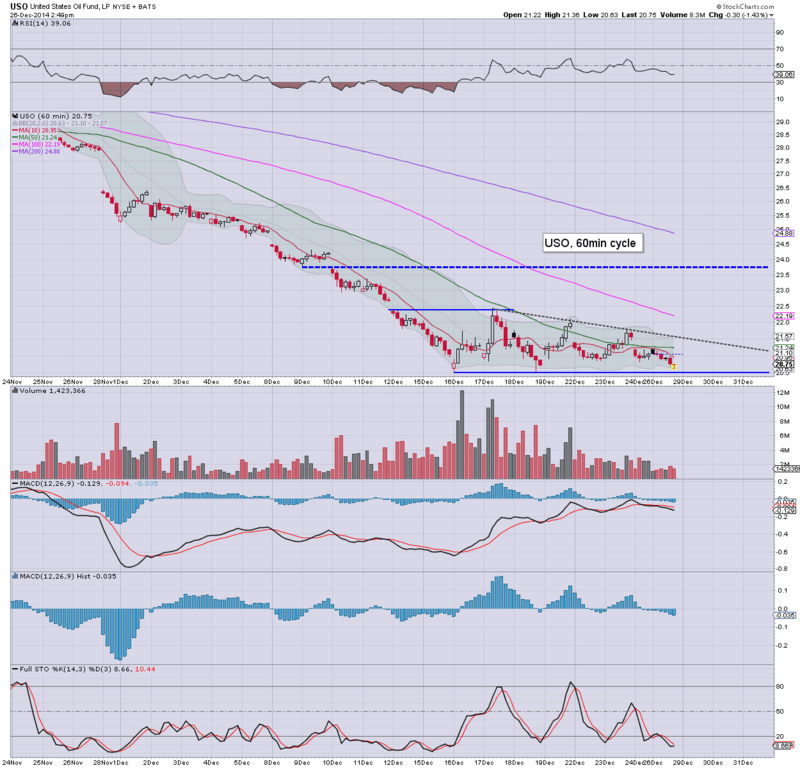 The 12/11s look viable into end year/January. Across the week, the VIX declined -12.1%. 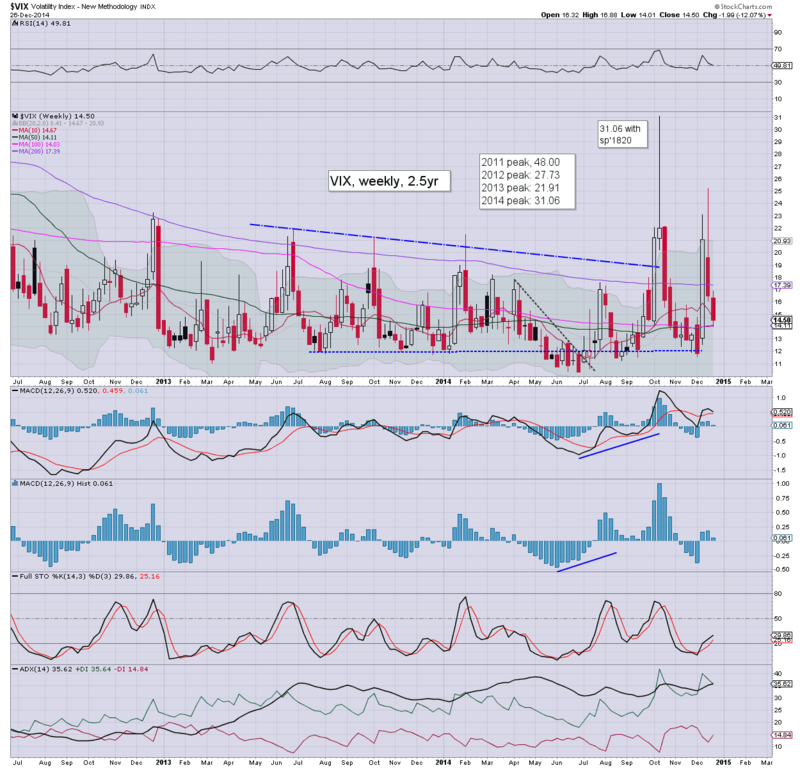 *not surprisingly, there was a last minute 'whack the VIX' event.. as often happens into the weekend. 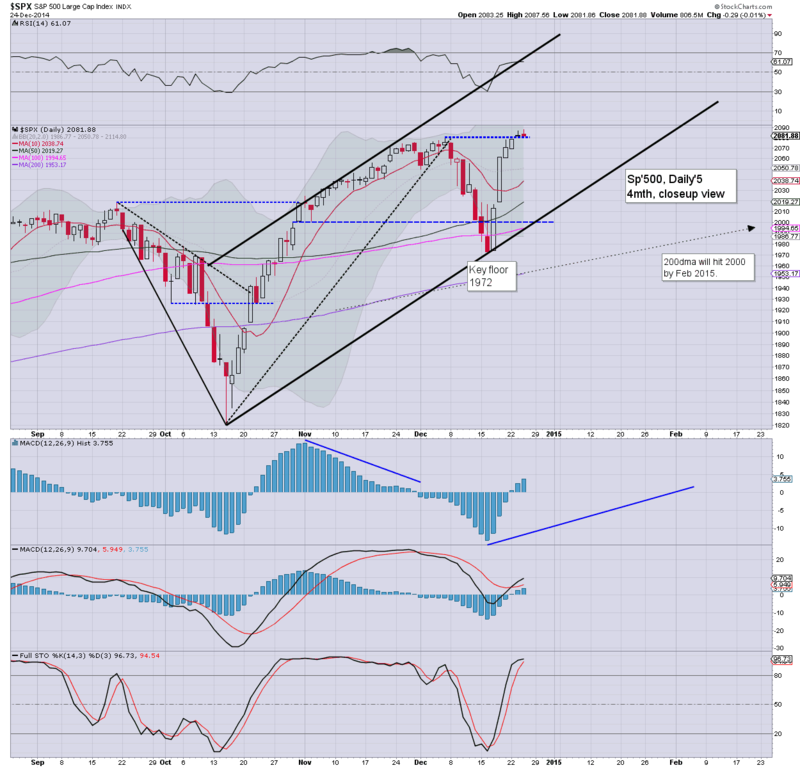 Weekly MACD (blue bar histogram) cycle is set for a bearish cross, with a viable 4-6 weeks of downside... reflecting an equity market that could easily be in the sp'2040/60 zone by late Jan/early Feb. Most US equity indexes closed higher for the seventh consecutive day, with new historic highs for the Dow, SP, and R2K. 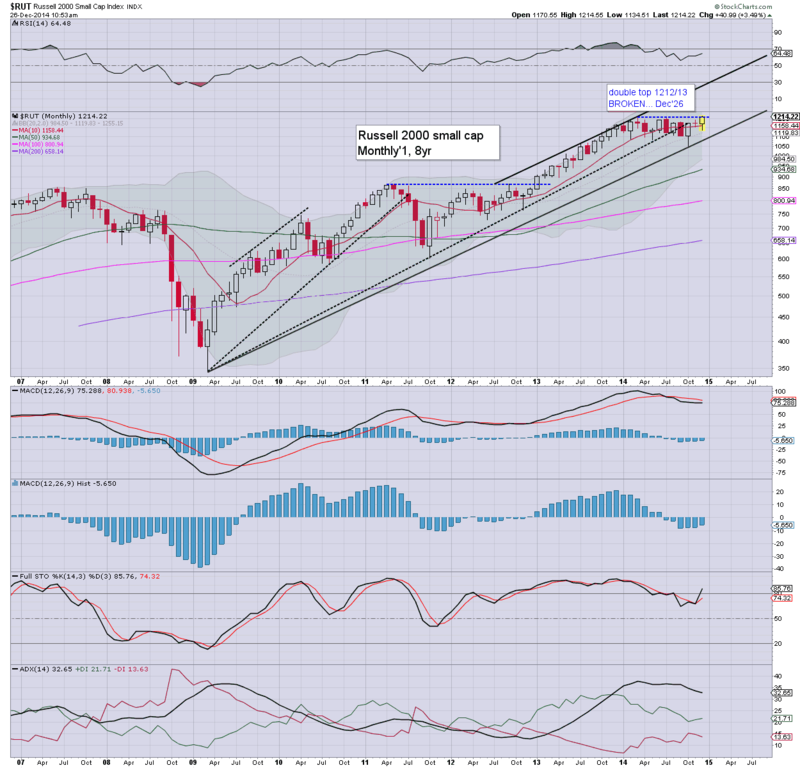 The sp'500 settled +6pts @ 2088. The two leaders - Trans/R2K closed higher by 0.2% and 0.7% respectively. Outlook is bullish in early January. Little to add.. on what has been an interesting... but naturally quiet holiday trading week. Meanwhile, over in Thailand... perhaps this is one way to get the market 'to da moon'? the usual bits and pieces to wrap up the week.. across the evening. Since the sp'1820 floor of Oct'15, the market has rallied an extremely powerful 272pts (14.9%). This week will make for the 9th net weekly gain.. of 11 weeks. With the R2K now having broken out of a year long trading range (much like Transports across 2012)... much higher levels look due next year. *Oil trying to turn on the smaller hourly cycle... key level remains $20.53. Suffice to say... regardless of the exact weekly close.. its been another week for the bull maniacs, and even the pre-FOMC cycle low of sp'1972.. is now 6% lower. 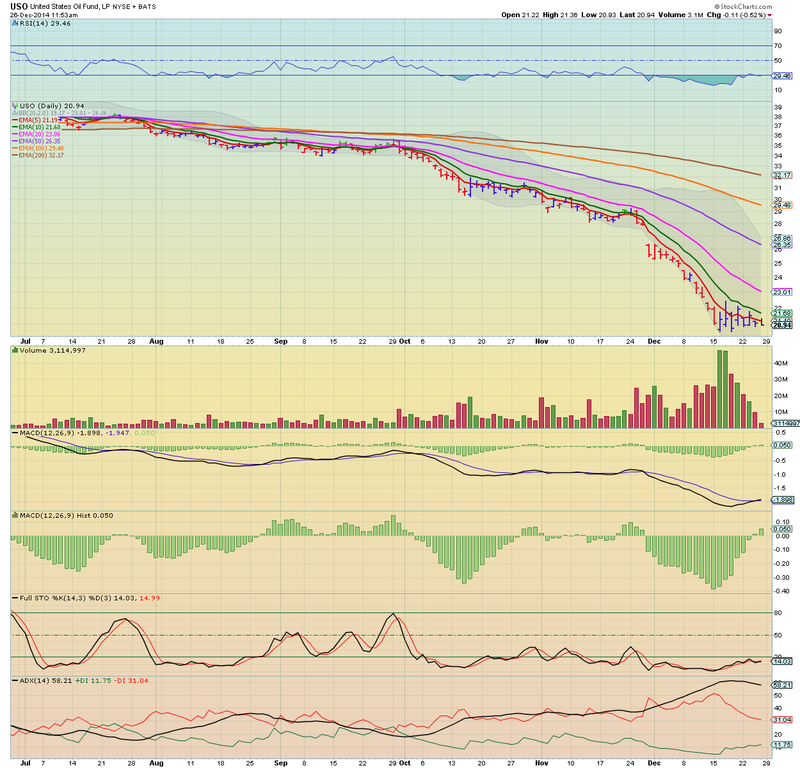 Anyone seriously think we'll be trading under sp'2000 again any time soon? Not surprisingly, price action remains one of low vol', and with it being a holiday period, underlying momentum remains to the upside. The sp'2100s are due... monthly/weekly cycles are offering 2035/40 by mid Jan. US equities remain moderately higher, in what is day'7 of the wave from sp'1972... some 119pts (5.9%) lower. The R2K has put in a new historic high of 1215, next soft target is around 1250. 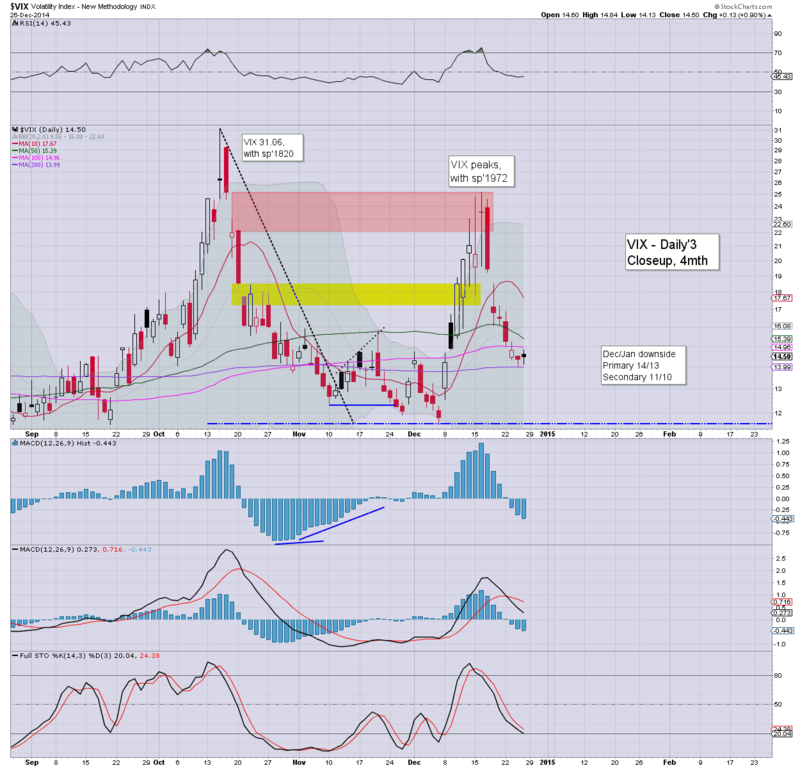 VIX is in micro churn mode in the 14s. Energy remains weak, Nat' gas -1.3%, whilst Oil is -0.5%. *the 8th blue candle on the daily Oil/USO chart... building a floor... or churning a very large flag? I'm guessing Oil floored last week with a micro-double floor of USO $20.53/54. So.. a seventh day higher for most indexes... and there is little reason why this won't continue into early January. Notable gains, GDX +2.8%... helped by another vain bounce in the metals, Gold +$20. For those with eyes on the bigger picture... today is so very important to recognise. *I'm somewhat tired (hey, its Boxing day.. most of Europe is closed)... and it looks like snow might start falling over London city this evening. 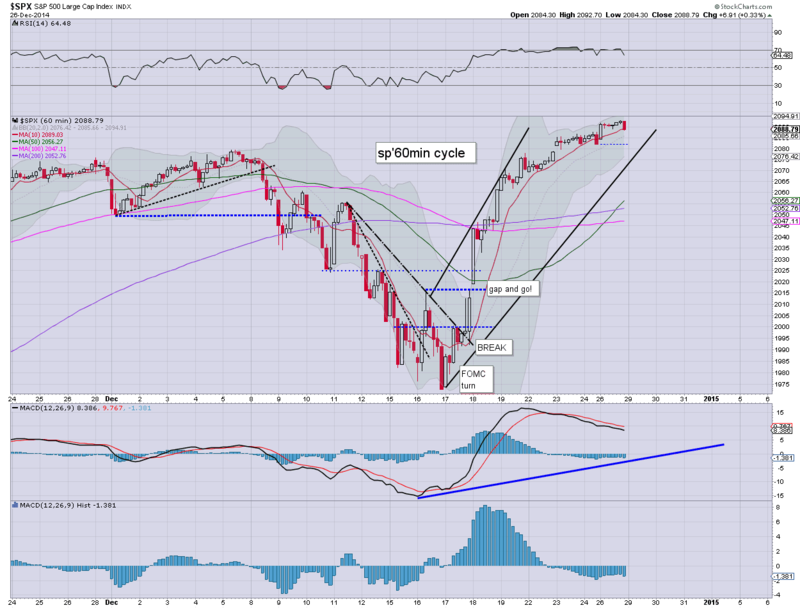 US equities open moderately higher, with the Sp'500 breaking a new historic high. Most notable, the R2K is set to break the July high of 1213.55. 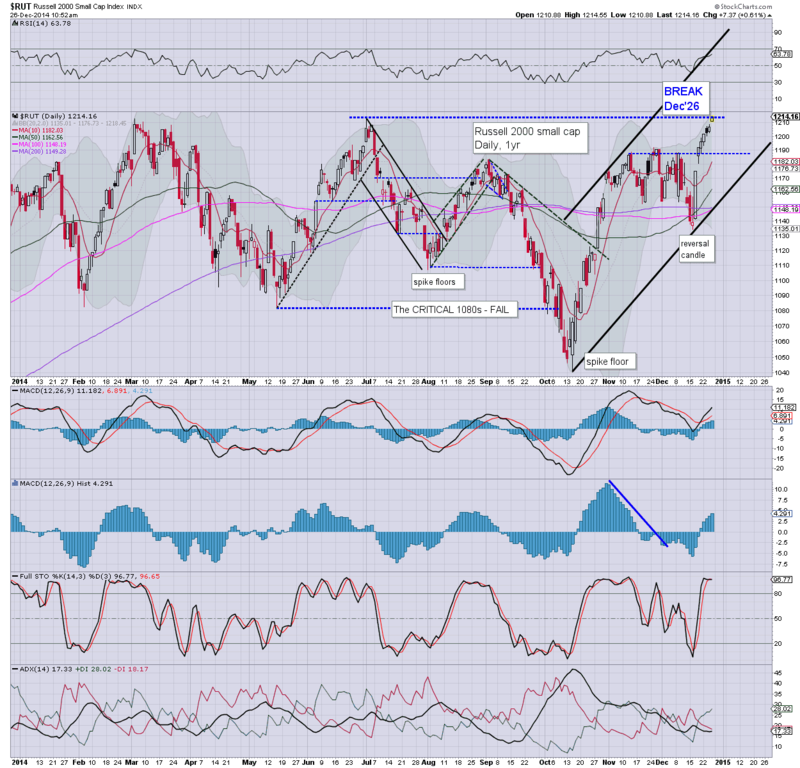 Once broken.. it will offer a powerful bullish signal for the ENTIRE market for 2015. 10.02am.... NEW HISTORIC high for the R2K. Anyone not taking this index seriously... is going to have a real bad 2015. First soft target... 1250/75 in Jan/Feb... the 1300s. 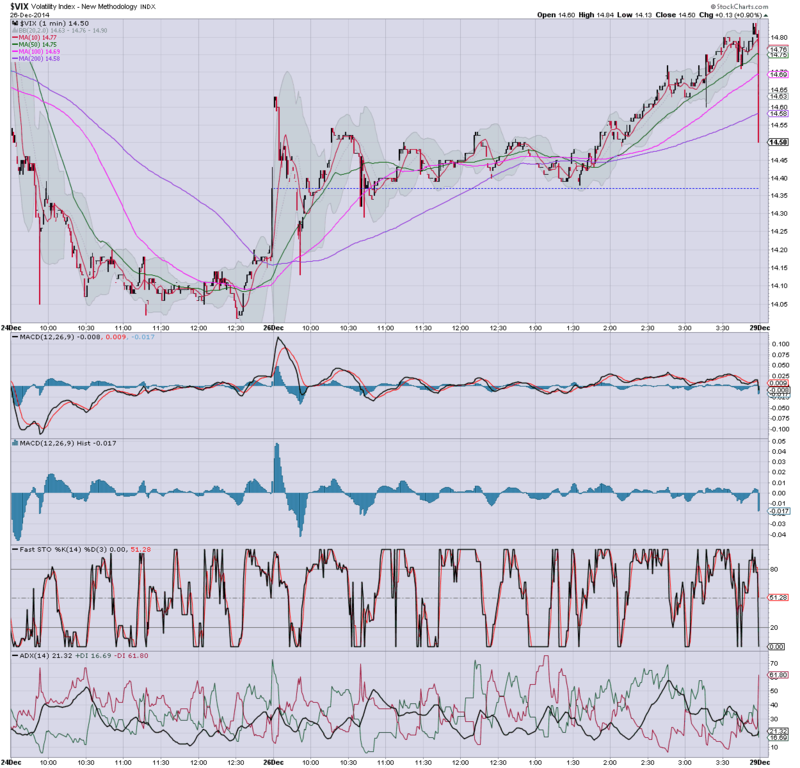 The 1500s look viable as early as mid summer.... how long until the mainstream start joking about 'R2K @ 2k' ? Good morning. Futures are moderately higher, sp+4pts, we're set to open at 2085. Metals are sharply higher, Gold +$20. Oil is similarly on the rise, +1.4%.... set to break into the low $60s within the near term. So... equities are set to open higher, and another set of new highs are viable, not least in the two leaders - Trans/R2K.